Ok, I lied. I don’t really have 2,015 resolutions this year, although my todo list is almost that long. Instead, I offer you the 15 New Year’s resolutions that I’ve made for Haley in 2015. That’s a pretty manageable number after all and I’m all for making realistic goals when it comes to New Year’s resolutions. It’s not too late to join me and put those best intentions to the test! 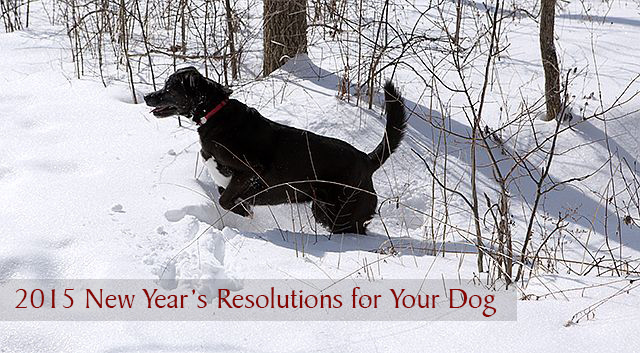 Consider some of the resolutions below to make 2015 a healthier and happier year for your dog. It’s at the top of most people’s resolution lists after eating all those Christmas cookies and holiday treats and a lot of dogs need to shed a few pounds as well. Haley has two or three pounds to lose to reach her ideal weight. We can do that! Yes, another resolution that most of us have in common with our dogs. 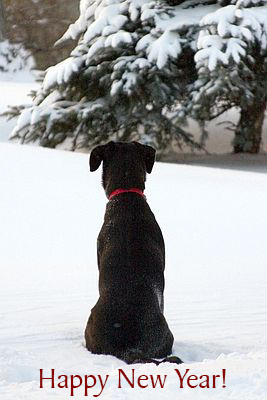 It’s pretty easy to slack off over the holidays and winter walks sometimes aren’t a lot of fun, but exercising is a great way to bond with your dog and keep her in tip top condition for a healthy 2015. Is it time to take a second look at your dog’s diet? There are many new, healthy and convenient options for feeding your dog a better diet than the average dry dog food. I’m going to continue researching the raw food diet this year to see if it might be right for Haley. It’s time to gather those cute cookie cutters and have some fun creating healthy, homemade dog treats for your pup. I’m anxious to try some of the recipes I’ve been collecting and look forward to sharing them with you later this year. Most dogs know some tricks and enjoy earning rewards as they perform their favorite skills. Why stop with just a few of the basic tricks? Haley loves the challenge of learning something new and I’ve been slacking off lately with trick training, so I’m looking forward to working with her more this year. No matter how well behaved your dog may be, there’s always a little room for improvement. We’re going to be working on reinforcing good manners in 2015, including loose leash walking and calmly greeting other dogs. If your dog loves to have her nails trimmed, consider yourself lucky. Haley tolerates nail trimming sessions, but it’s not her favorite way to bond with me, so I tend to wait a little longer than I should between nail trimmings. I’m going to set a regular schedule with calendar alerts to remind me to stay on top of keeping her nails nice and short. 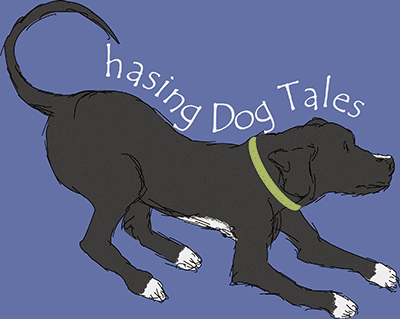 Dog-based novels, training books, health-related dog books, there are plenty of amazing reads to keep you entertained this year. I know I’m looking forward to catching up on some great books in 2015. Consider attending a First Aid class for dogs this year. You never know when you may have the opportunity to save a life. It’s a good idea to stay informed about the latest products to prevent heartworm and other parasites that can affect the health of your dog. I plan on researching some natural flea and tick products this year and will talk to my vet about how to best keep Haley healthy with the least amount of chemical parasite control. If your dog suffers from allergies, you know all about paw licking, ear scratching, itchy skin and other related symptoms. The New Year is a good time to revisit a discussion with your vet about how to best keep allergies under control. Some dogs require daily grooming to keep their coats in good, matt-free condition. Although I don’t have to worry about matting with Haley’s short coat, it’s good to keep all that excess dog hair outside of the house by remembering to brush her every day. Yep, probably the most dreaded and most neglected of the daily health routines for dogs. I’m going to make a real effort to be better about Haley’s dental care in 2015 by brushing her teeth every day and looking into other methods to help keep her teeth and gums in good shape. Nobody likes to be bored, that includes our dogs too. Find something new and interesting to do with your dog each month. Keep things fun by trying a new activity or take a hike somewhere new. Fostering dogs or volunteering at a local shelter or rescue are perfect ways to help out some pups in need or consider enrolling your dog in AKC’s Canine Good Citizen Program. Good luck with your 2015 New Year’s resolutions and look for updates about the progress of Haley’s resolutions during the year. I would love to hear what topics you would enjoy reading more about this year. Send me your ideas and share your New Year’s resolutions for your dog. Happy New Year! UGH! I am so horrible at making resolutions! I tend to fail them when I do, so I sort gave up on the idea! BOL! Yes, it’s so easy to start off with the best intentions, isn’t it? To me, they are more like goals I hope to attain. Isn’t it great how dogs love your cooking, no matter how it turns out? Wishing you and Laika and very Happy 2015! Yes, it’s dieting and exercise for me as well as Haley, lol! Hi there! I found my way here from the Pet Blogger’s Gift Exchange and am adding you to my blog roll! I have two rescue dogs and love following others! I’m with you on the nail trimming resolution. Honey’s grow like mad and I have trouble keeping up. But we’ll need to get them down so she can be safe walking around the boat. I just read Jana Rade’s post on tackling one nail a day to make it easier on both her and the dogs. That’s an interesting idea I may try! Great list…I am remiss in several of these, so this is good incentive and reminder! Yes, it sounds like we all are especially bad about keeping up with the nail trimming. I need to make a point to brush my pets’ teeth as well. Like most pet owners, I’m so bad at making this a priority. Luckily, Ace’s teeth are pretty good as is one of my cat’s teeth. My other cat has horrible teeth. Poor guy. And nail trims are an issue too. Ace used to not mind having his nails trimmed, and now he hates it so I know it’s totally my fault. I am nervous trimming his nails, and he is now scared too! Plus, I’ve cut them too short a couple of times and probably overreacted. Sigh … At least my cats don’t care when I trim their nails. Thank goodness. Ugh, nail trimming sounds like it’s an issue for a lot of people. I’ve tried several ideas to help Haley relax, including belly rubs during the process, lots of treats, etc. The best process that works for us now is to relax and just get it done, then treats afterwards.